The Si impact is the latest evolution in a long line of consoles from Soundcraft to bear the Si name. Si Compact was originally developed in 2010 alongside the Vi1 to introduce Soundcraft digital mixing at a new price point and a new ‘compact’ form factor. The technology within Si Compact was developed by Soundcraft a couple of years prior during Si development and was essentially the same DSP engine but repurposed into a completely new and revolutionary workflow that has remained unchanged ever since. Si Compact quickly became a favourite amongst engineers as it offered the perfect balance between digital flexibility/power and analogue-style workflow that featured a sound that remained warm and punchy - adjectives that are rarely attributed to other digital consoles. As the competitive landscape changed, so too did Soundcraft with the introduction of Si Expression and Si Performer consoles. Featuring a huge leap forward in DSP technology, these consoles had impressive channel counts (up to 80 inputs) as well as LCD scribble strips, VCAs, 35 mix busses, and they offered the same mix power on 16, 24, and 32 fader frame-size options. Si Impact was released in 2015 and featured the greatest-hits collection of features from all Si consoles packaged into a single chassis with 32 mic/line inputs, 35 mix busses, and 24 faders. What makes Si Impact special now is the same essence that was introduced 8 years ago with Si Compact but why is it special? Why is it a favourite amongst engineers? Why is the same design/format as popular now as it was back then? In Sound Tech’s guide to Si Impact, we’re going to take an in-depth look at Si Impact and talk about its key features, how it differs from anything else on the market, and how it could become the new centre to your live production. Si Impact is a digital live mixing console with enough DSP capacity to mix up to 80 inputs and send audio to 35 locations including 20 aux busses, 4 stereo matrices, 4 FX engines, as well as Left/Right and Mono busses. On the face of it, apart from some faders Si Impact bears little resemblance to an analogue console however once you dig a little deeper, there are more similarities than meets the eye. Traditional analogue consoles are built using input modules and channel strips where every channel features a full dedicated strip of controls. Where the sea of pots once sat on an analogue console, Si Impact only features 27 rotary encoders and a 4” touchscreen. These controls are essentially your new channel strip but rather than being repeated 16/24/32 times for every channel (like an analogue console), there is just one channel strip that can be viewed, assigned, and controlled for each input by using the SELect buttons. As is evident very quickly, this Assignable Channel Strip (or ACS) features parameters that you would not find on a standard analogue console including a noise gate, compressor, 4-band fully-parametric EQ, and time delay controls. Whereas these features would previously exist on external units inserted into the signal path when required, Si Impact has 111 compressors and 80 noise gates included as standard. This is made possible thanks to Si Impact’s internal processing and DSP manipulating 1’s and 0’s rather than current and voltage. Another aspect where Si Impact closely resembles an analogue console is its abundance of analogue I/O on the rear panel. Si Impact was designed to easily swap with an existing analogue system by utilising the same analogue multi-core connections that your analogue system requires. 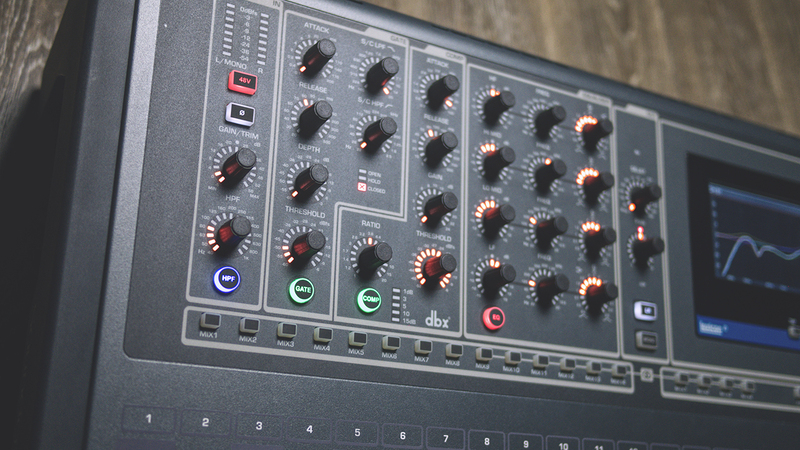 To facilitate this the rear panel of Si Impact looks similar to an analogue console; there are 24 mic/line inputs on XLR, 8 mic/line inputs on combi-jacks, and 16 line outputs on XLR. If you connect audio into input one of Si Impact, you can then pick-up that audio on channel one. If you send that audio into bus one, the audio will come out of output one. This one-to-one patching relationship can be easily configured to any desired patching concoction required however out-of-the-box, you are given the best possible chance to get up and running quickly. Besides those basic similarities, the power and flexibility of a digital system far exceeds that of any analogue console that you would find. Let’s get stuck into the fine details and discover what that power and flexibility means for your production. The ACS (Assignable Channel Strip) on Si Impact lives above the faders across the top of the console and they are split into different sections for different processing objects and feature LED rings and ledgering around the pots to enable quick-reading on the surface itself. Applying processing to a channel on Si Impact is never more than one button press away; press SELect on the channel you wish to edit and then turn the available parameters within the ACS section - it’s that simple. Whereas some consoles resort to screen interfaces, pages, and menus - all of the available parameters onboard Si Impact are editable via a dedicated control (Soundcraft call this one-knob-one-function). These functions include; variable high-pass filter, compressor (with attack, release, ratio, makeup gain, and threshold controls) noise gate (with attack, release, depth, threshold, SC hpf, and SC lpf controls), 4-band parametric EQ (with gain, frequency, and bandwidth controls per band), time delay (up to 500ms per channel and bus), and pan. One of the biggest concerns that people express when they are considering moving onto a digital console is their inability to reach for any given channel parameter in the heat of the moment like how they are accustomed with an analogue console. Compared to some digital consoles that conceal EQ bands and dynamics parameters within screen menus, Si Impact displays its wears for all to see in the form of physical control and is probably the best console in the market to enable quick access to any parameter. When you are looking at mixing monitors on an analogue console, you would have maybe 4-6 auxes at maximum to play with; a digital console can feature more than 32 stereo auxes in total. Whilst Si Impact features a maximum of 14 busses, that would still prove to be a huge handful if it was managed in the same manner as an analogue console (imagine 14 send pots below each channel!). For that reason, digital consoles introduce moving faders into the workflow to aid in monitor mixing. Si Impact in particular employs a system called tOTEM (one touch easy mixing) which allows the user to access the mix bus contributions for any available mix bus by using just one button press. Below the ACS lives a row of small buttons labelled mix 1-14. Pressing one of these buttons ‘flips’ the faders to display the current send and contribution levels of the input channels being sent into the bus. Whilst the faders are flipped in this mode, you can simply raise the fader of your desired channel to send that audio into the selected bus - simply deselect the chosen bus to return back into the default FOH view. Another reason why moving faders are essential on a live console is because of the required fader paging that is required to reach all possible input channels. A quick count-up of inputs vs faders reveals that Si Impact has 32 mic/line inputs on the back, but only 24 input faders on the top. This means that a small amount of ‘paging’ is required in order to reach the fader of all available inputs. Channels 1-24 live on layer A whilst channels 25-32 live on layer B. As more input channels are added onto the system then it you could have to page through all 4 fader layers to reach the 64 available mic inputs. Whilst paging-through these fader layers is a large concern expressed by a lot of analogue console users, Si Impact employs a few tricks up its sleeve to help any engineer feel at ease when they are using the console in anger. The beauty of controlling 1’s and 0’s in the digital domain is that any fader - with some clever coding - can control any channel on the console at any time unlike an analogue console where each fader is hardwired into its channel. To take full advantage of this, Si Impact employs a “fader setup” feature that allows the user to configure any of the faders to display any channel or bus combination on any fader layer. Simply SELect the fader you wish to reassign, tap fader setup on the touch screen, and then select the DSP object you wish the fader to adjust. This allows you to place subgroup masters next to input faders, place FX returns next to vocals, or add new channels into your layer (when an unexpected input needs mic’ing). The 14 monitor busses onboard Si Impact feature a granularity that enables a multitude of different applications. Traditionally an analogue console would provide enough flexibility to send channels to some specific busses either pre or post fader. Si Impact however enables you to send any of its 80 input channels to any of its 14 busses at one of 3 discrete pick-off points: pre-dynamics, post-EQ (pre-fader), or post-fader. This amount of flexibility means that the busses can be repurposed to satisfy multiple different applications in different environments. Monitor busses are traditionally built-up using pre-fader contributions but they can also be mixed and matched with post-fader sends to incorporate more dynamic mixing using the FOH faders. FX send levels for example can be sent into monitor busses post-fader so that adjustments in level within the FOH (increased for atmospheric passages, reduced in-between songs) adjust the FX monitor send automatically. Pre-dynamics options are great for instruments that certain processing in the FOH but not within the monitor bus; bass guitars for example can benefit greatly from compression in the FOH however most bass players would prefer to hear their signal uncompressed in their monitors or IEM pack. Digital consoles and Si Impact in particular also enables more flexibility when it comes to satisfying stereo mixes and IEM systems. Busses 9-14 can be made stereo quite simply and easily by changing the mix width from mono to stereo using the touchscreen. Whereas alot of digital consoles would then tie-up two mono busses; one for left and the other for right, Si Impact features an extra bus “under-the-bonnet” of the console that can be accessed, revealed, and engaged when the bus is made stereo without tying up 2 valuable busses. With faders flying around and changing function every 5 minutes, it’s very easy to get lost on a digital console. Whilst some consoles offer little to no user feedback to tell the operator what the faders are controlling, Si Impact offers perhaps the most innovative visual aid of all: faderglow. 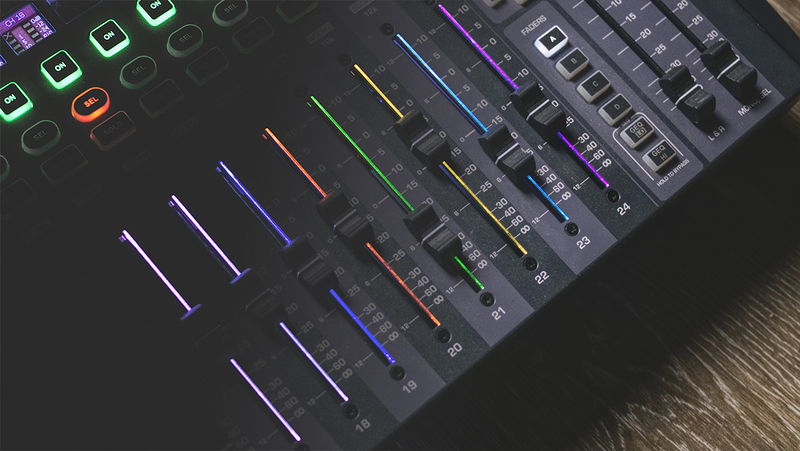 Faderglow is a technology developed by Studer and Soundcraft and is essentially an LED that lives beside a fader slot and lights a specific colour to help identify the fader’s current function. When the user selects a mix bus tOTEM key and begins mixing, the first thing that they notice is that all of the faders are lit up yellow - this is a big indication that you are currently mixing into a bus and not the FOH. Other digital consoles would typically not change their visual status at all to reflect this mode or would at most resort to a small flashing LED located somewhere on the surface. With fader paging and repurposing being a big concern for a lot of users looking to take the plunge into digital, this level of visual feedback goes a long way to help people feel at ease when they are operating Si Impact. Perhaps the biggest draw to a digital console is the ability to store and recall snapshots and change the entire configuration of the console with a single button press. By utilising motorised faders and digital potentiometers, Si Impact can change its state physically and digitally to reflect the desired snapshot. Storing and recalling desk settings is an attraction for a lot of engineers because of the ability to store and recall settings for songs within an artist’s set, bands within a festival, or configurations within an install. Si Impact features a “cue list” that contains multiple “snapshots” that can change parameters including fader levels, bus send contributions, channel strip settings, channel names, or even bus pick-off points. 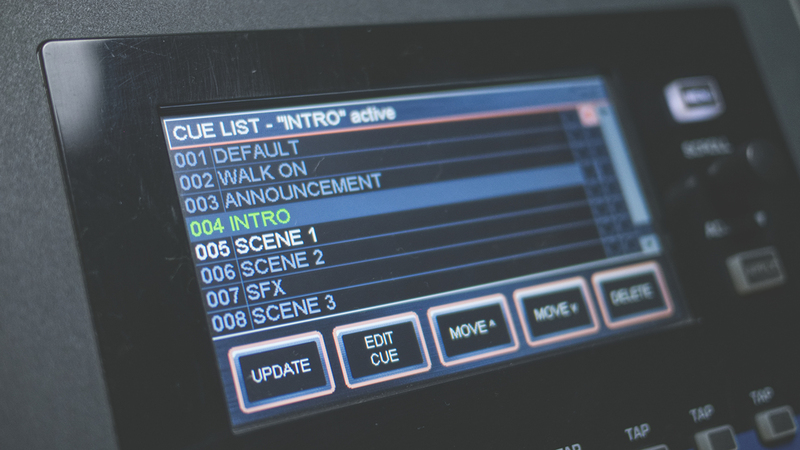 The collection of snapshots within the cue list are stored inside what Soundcraft call a “show”. A show could be labelled something like “band ‘x’ - Royal Albert Hall” whilst the snapshots could be labelled “song 1, song 2, song 3 etc”. In environments such as theatres, it would not be uncommon to have a snapshot for every single scene, cast change, or set change throughout the performance. Some shows can easily amount to over 300 snapshots and with unlimited snapshot storage data on SI Impact, there’s plenty of opportunities for more automation. Once you have created your show on Si Impact, you can then export that show directly onto a USB stick to be backed up, or loaded onto another console. Show files are interchangeable between any SI Impact, but also between any Expression, Performer, and Compact consoles to enable maximum flexibility and compatibility for travelling engineers. The advantage of being part of such a large umbrella company like Harman is that you can leverage all of the best technology of your fellow brands to build up a processing library that contains the greatest hits of industry processing. It’s no secret that Soundcraft have no expertise in designing compressors, however dbx - another Harman company - have an extremely reputable name in the area! 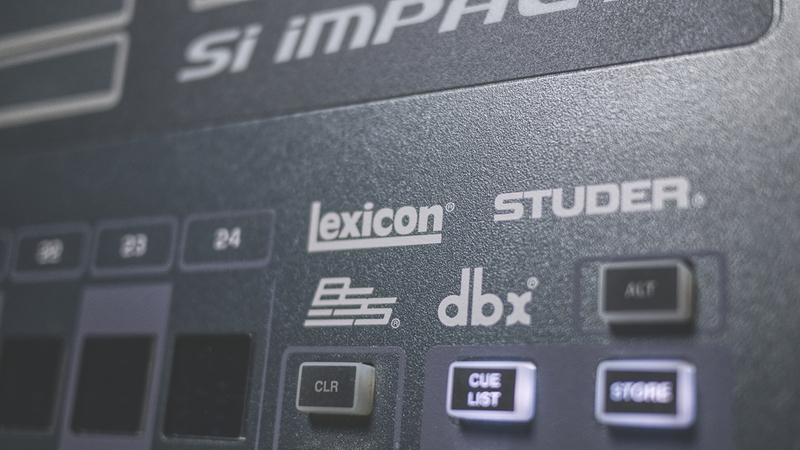 All of the processing within Si Impact has been carefully designed and tuned by dbx, Lexicon, Studer, and BSS to create a suite of processing objects that give you as the engineer the very best tools to create the best possible live sound. Lexicon is perhaps the name that jumps out the most. Lexicon was founded in 1971 and has been the go-to reverb for some of the biggest names in the live and studio industry; it’s quite likely that if you walk into a major studio anywhere in the world, they will have a Lexicon reverb unit or controller on or around the console/mix position. Si Impact features 4 Audio DNA chips that are the same brains that you would find in dedicated reverb units such as the Lexicon MX and MPX series. Each of the 4 effects engines on Si Impact offer 29 different algorithms ranging from plate, hall, and room reverbs, as well as digital, analogue, tape, and dual-tap/ping-pong delays. Each of those algorithms also feature up to 12 editable parameters that allow you to fine tune all of your effects to suit your specific purpose. The ability for a digital console to be flexible and expandable for different applications is essential in order for the console to facilitate different setups in today’s touring circuit. Si Impact features a plethora of expansion options via 2 dedicated option card slots that are built into the console. 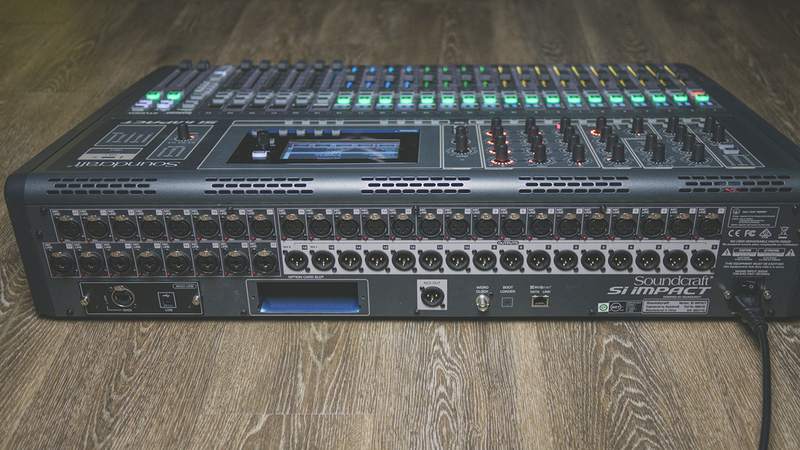 This is compatible with a huge range of Si option cards that have been developed by Soundcraft to maintain the latest communication standards with 3rd party devices. Amongst the options are a few cards in particular that will be useful for the vast majority of potential users. The MADI USB option card comes pre-installed in Si Impact and features 2 connectivity ports - MADI and USB. The MADI port is a Cat5 port within a Neutrik ethercon connector and is used exclusively for stagebox connectivity. 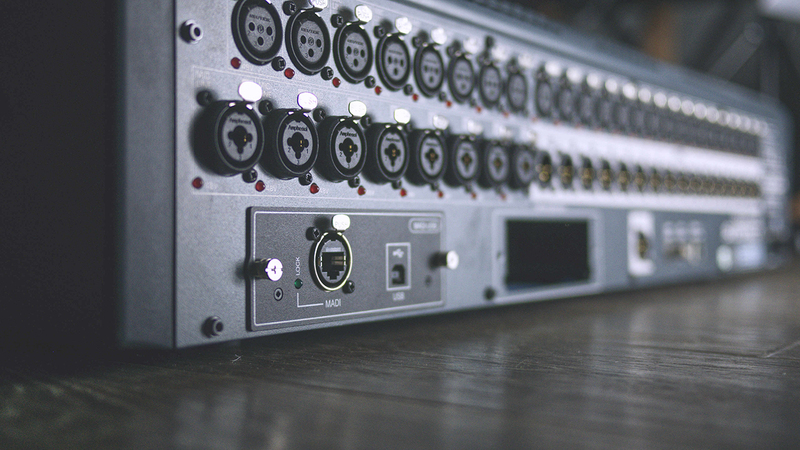 The Cat5 cable transports 128 channels (64in/64out) and connects to any of Soundcraft’s digital stageboxes such as Mini, Compact, or Vi stageboxes. The cable uses a custom-packaged MADI protocol to transport audio as well as control data for the analogue preamp control down a single cable. The USB port on the MADI USB card is used for multi-channel recording and playback. Up to 32 channels can be streamed to and from the USB port in order to transform Si Impact into a 32x32 channel USB audio interface. All of the USB paths on the card can be patched-to individually as either direct outputs per-channel, or mix outputs for the main LR or aux mixes. More complex solutions include a Dante option card which is a network-based audio distribution protocol that is quickly finding itself as the market leader. Dante enables Si Impact to send 64 audio channels and receive 64 audio channels to and from the Dante network. The console can freely assign any input or output to the network, however the system needs needs further patching using Dante controller; a dedicated software package that routes and configures the Dante network and can be accessed using a laptop. Other option card solutions include Aviom (a popular personal monitoring system), Cobranet (a legacy networkable audio solution), dual MADI (for redundant stagebox connections and routing), Blu link (for audio networking between Harman products), as well as an AES output card. Si Impact is the perfect choice for digital console users looking for a compact and flexible solution to take on the road as well as users who are just moving into digital consoles and need a console that can provide the required power but in a manageable way. Once you have taken the plunge into digital mixing consoles and you’re standing in front of an Si Impact, you’ll soon realise that it’s a pretty nice place to be. All of the vital controls are always accessible and input sources passed through Si Impact will benefit from the wealth of onboard processing to end up with a sound that sounds cohesive, more detailed and more consistent then you have ever experienced before.